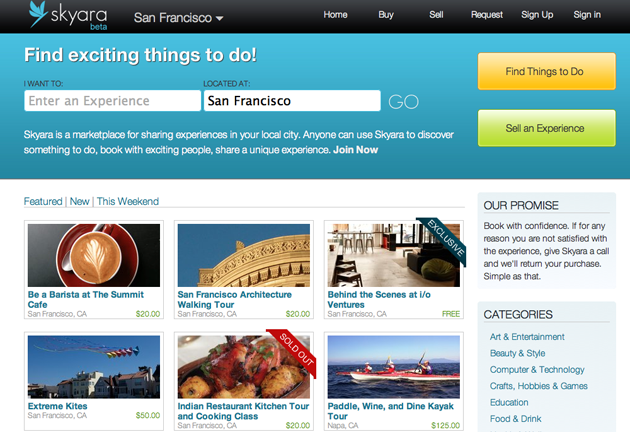 i/o Ventures backed Skyara launches today as a marketplace for exciting things to do. 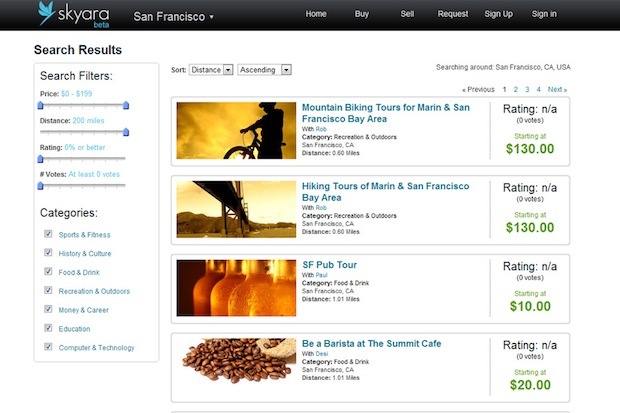 Founded by Jonathan Wu, Dennis Liu and Steven Ou, the site provides people who can offer new experiences like a culinary tour, personalized yoga or a beer tasting with a platform to do so, hooking them up AirBnB-style with people who seek new experiences like foodies or yoga fanatics. Key Skyara features include packaging, scheduling, booking and payments services and well as a Digg-like voting features and Skyara Requests, i.e. if a specific experience isn’t available on Skyara, consumers can request it and see if any vendor can customize their offerings. The founders say that they’re trying to create a new experience market similar to how Etsy created a new market for DIY craft fans, targeting people who ask, “What is there to do?” during the weekends The site currently has between 50-100 experiences available in the Bay Area and plans to monetize by charging experience vendors a 12% transaction fee. Skyara is also offering a $5 off promotional code to the first 100 TechCrunch readers to sign up with the referral code TECHCRUNCH. And for those interested, AirBnb co-founder Nathan Blecharczyk has offered lunch as a Skyara experience (starting at $10) in solidarity.